There are very few advantages of being menopausal. And perhaps one of the worst aspects of menopause is experiencing many of the different symptoms at this stage. During menopause, you may also experience one of the more unpleasant menopause symptoms: irregular periods. Although irritating, you do have the power to fight back against irregular periods. Read on for your complete guide on irregular periods. The first period a woman experiences is known as menarche. In the following years, she develops a regular cycle. However, this cycle is not perfect and it is rare for a period to arrive at the exactly the same time each cycle. A period may be irregular. 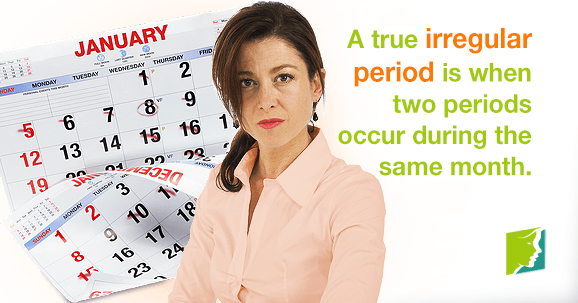 A true irregular period is when periods are completely missed or when two occur during the same month. During menopause, your body is going through a lot of changes and experiencing a myriad of symptoms, due to hormonal fluctuations. Hormones are vital to your body, and your body can regulate itself properly when your hormone levels are balanced, and working together. Two of the most important hormones in the female human body are progesterone and estrogen: these two hormones help to regulate the menstrual cycle and help to keep your periods regular. However, when levels of these two hormones fluctuate, it can cause the body to become confused and lead to irregular periods and many other menopause symptoms. Read on to learn how you can prevent irregular periods. How Can I Prevent Irregular Periods? Irregular periods can be very distressing. It can make you really anxious and on edge not knowing when your next period is going to arrive. Unfortunately, it can be very difficult to actually combat irregular periods. A great way to start is by trying to improve your diet and increase the amount of exercise you get. You may also want to try herbal remedies. Other treatments, such as hormone replacement therapy (HRT) may be more costly and dangerous. Click on the following link to learn more about how you can prepare for menopausal irregular periods. Q&A: Should I Be Surprised If I Am Having Irregular Periods at 40? Menopause brings with it a slew of symptoms, such as irregular periods. Read all about why you should not be surprised to have irregular periods at 40 here.